I've got a couple of fairly large jewelry boxes. I bought large ones not because I have tons of jewelry, but because I hate wading through the jumble of chains, earrings, pendants, bracelets, et cetera that my jewelry box almost always eventually turn into. I figured that if I have to fish out bobs and pieces through the chaos that's in the box, then let it be a big box so I at least have space to move things around. But not with my important pieces. 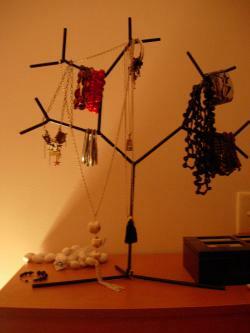 Anyone who appreciates jewelry should invest in a good stand to showcase her favorite pieces. There are plenty of jewelry trees out in the market, but make sure that when you get one, it's heavy and sturdy enough and won't topple over when you hang your chains, hoops and precious gems on it. 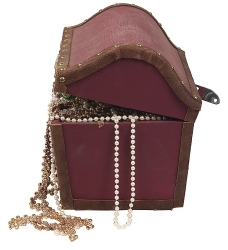 It would be nice to get something that would great on the top of your dresser, with or without an assortment of women jewelry on it. And lastly, there need to be a catchment of sorts where you can place items that can't be hung, like stud earrings, brooches and luxury pendants. Kendra Smooth has more nifty tips on organizing jewelry. Elle magazine's November issue is already on news stands in case you have picked up a copy yet. Not really looking a head I guess since it's October already which mean fall has begun, this issue give you fashion and style tips for dealing with your relatively new fall wardrobe. Among the tipsters if fashion maven, nina Garcia, who tackles the notion of less is more – as in you can dress for less and get a whole lot more these days. Among her picks are accessories, including jewelry of course, though I would have liked to see a little more emphasis because honestly that's one of the great things about having lots of jewelry. You can have a totally different look with many of the same outfits with just the addition of a small number of baubles. Pictured above are some of her mix and match ideas for day, evening, and weekend. She leans towards classics when it comes to clothing and jazzes them up with some trending additions such as funky fun shoes and beaded jewelry. You can find more fall fashion picks from Nina at the Elle site. I was so happy today to discover the latest issue of Victoria magazine stuffed inside my mail box. This publication has finally returned to us for what I hope is a very long time. I used to subscribe to it years ago, and for some reason (I guess it wasn't popular enough) it stopped publishing. I had my subscription already paid up and ended up getting stuck with some idiotic magazine about living on the coast – Coastal Living – I think. I do live on the coast, but I just couldn't get into the magazine. It wasn't the same as Victoria. Serenity awaits you in every issue of Victoria magazine. Unabashedly feminine, Victoria offers the best in charming home dÃ©cor, gracious gardens, entertaining touches, intimate profiles of inspiring women, and off-the-beaten-path travel destinations. Leave the every-day behind with Victoria! The new subscription rate is a tad more pricey at about $20 versus $12 in the old days, but hopefully, it will be worth it and Victoria will be around to stay this time! Hmmm…maybe I should write to them and offer to be their jewelry editor. What do you think? Pardon me as I take a moment for a little shameless self-promotion, but I was recently interviewed for an article from Ink magazine concerning the growth of jewelry making has a hobby. The article was just published, so if you are from the Bay area, you may have already seen it, "Handiwork more than tea cozies." Here's a little snippet, though I hope you get a chance to read the whole thing. I does require a quick registration, but it took about two seconds. 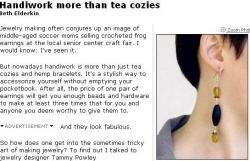 Jewelry making often conjures up an image of middle-aged soccer moms selling crocheted frog earrings at the local senior center craft fair. I would know: I've seen it. 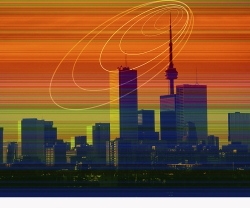 But nowadays handiwork is more than just tea cozies and hemp bracelets. It's a stylish way to accessorize yourself without emptying your pocketbook. After all, the price of one pair of earrings will get you enough beads and hardware to make at least three times that for you and anyone you deem worthy to give them to. So how does one get into the sometimes tricky art of making jewelry? To find out I talked to jewelry designer Tammy Powley (www.tammypowley.com), from Port St. Lucie, Florida. Powley is the author of several books on jewelry design as well as a few popular beading Web logs, which she updates regularly. Thank you to Beth for being so kind and for including my URL. I'm amazed at how many times I read similar articles on the web about other designers, and yet no URL. 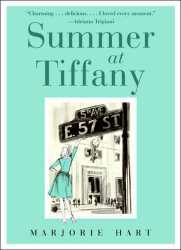 The summer is nearing an end, but there is still time to get some fun reading in, and this new book by Marjorie Hart called Summer in Tiffany might be just the thing to enjoy while lounging by the pool. From what I've seen over at Amazon.com as well as the Barnes and Noble book site, it looks like it's getting some pretty good reviews from readers who are looking for something on the light side this summer. At the age of 82, Hart, a professional cellist, recalls 1945, when she and her best friend, Marty, students at the University of Iowa, spent the summer in Manhattan, in this pleasant but slight memoir. Failing to obtain work at Lord & Taylor, the pair, self-described as long-limbed, blue-eyed blondes, were hired at Tiffany's-the first female floor sales pages, delivering packages to the repair and shipping department, for $20 a week. Hart details their stringent budget ("1. Two nickels for subway. 2. Sandwich at the Automat: 15 cents") and describes, somewhat breathlessly, what a thrill it was to see such luminaries as Marlene Dietrich and Judy Garland shop at the fabled store. Her romance with a midshipman, the combat death of her cousin, the news of the dropping of the first atomic bomb and a vivid account of the celebration in Times Square after Japan's surrender convey a sense of the WWII era, but without adding much illumination. She does, however, evoke New York City as seen through the eyes of two innocent smalltown girls. 16 pages of b&w photos and illus. I'm doing a little shameless shelf-promotion here. Tomorrow night at 6p.m. est I'll be chatting about jewelry blogging and professional blogging in general over at Chick Tech.net. I'll be talking with indie blogger and PR pro Jennifer Mattern about both indie blogging (her end) and network blogging (my end). Jennifer Mattern, of JH Mattern Communications, will be hosting a live interview with Tammy Powley, Executive Editor of Creative-Weblogging.com on July 18th, on how to become a professional blogger. Philadelphia, PA – ChickTechTalk (BlogTalkRadio.com/chicktech), the BlogTalkRadio show hosted by Jennifer Mattern of JH Mattern Communications(jhmattern.com), will be airing a live segment on Wednesday, July 18th at 6:00 pm Eastern time on the topic of what it takes to become a professional blogger. Mattern will be chatting with Tammy Powley, an Executive Editor with Creative-Weblogging.com, a major professional blog network, who handles blogger recruitment. The emphasis will be placed on the latter two types of professional bloggers, and how those interested in professional blogging can get their foot in the door with blog networks, or earn a living by running their own niche and professional blogs. You can find all kinds of little Gems of gemstone and jewelry knowledge over at Gabriel & Co. Though I did find the music a little irritating after awhile, I simply turned down my speakers so I could read through their information on jewelry care and education, which covers all kinds of factoids about semi-precious and precious gemstones. Once you are on the site, select the "Consumers" link, and you'll see a drop down menu for care and maintenance, education (that's where they have the gemstone information), and store locator. I was particularly impressed with the gemstone information. As you select a gemstone on the left hand side, for example peridot, a picture of the stone shows up and on the right hand side a list of details such as stone hardness, color, and so on. Scroll even further down and on the left you'll see a button for the web site's diamond guide. This brings you to yet another page that covers the 4 Cs of diamonds. If you are serious about jewelry, then you probably have a lot of it. 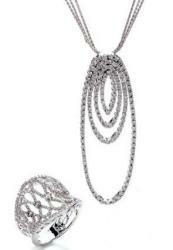 Most often, we tend to busy jewelry for specific outfits or just because we fall in love with a certain piece. However, it get the most out of your jewelry collection, it can be helpful sometimes to stop and consider how you are building your jewelry wardrobe. Any jewelry you wear every day should be something you love wearing. Your everyday pieces should be in good condition, should work with the rest of your wardrobe, and should reflect a style you'd like to repeat in your other pieces. If your everyday jewelry is starting to show signs of wear, have it fixed, upgraded, or replaced. While I have a lot of jewelry, I often find myself gravitating to some of the same pieces over and over again. Time for us all to pull out those favorite bracelets, earrings, and necklaces, and give them a good cleaning and ifnecessary, fixing.